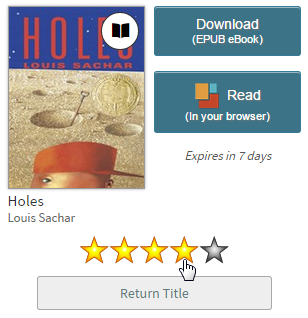 To rate a title in your library's digital collection, tap or click on the star rating you want to assign. You'll need to be signed into your library to add ratings. You can add ratings from a title details or search result (list view) page for any title. To rate titles you currently have checked out, go to your Loans page (under ). Once you rate a title, the stars will change color. To see all the titles you rated, click or tap , then select Rated titles (you'll need to be signed in to get to this page). From there, you can change or remove your ratings, borrow available titles, and place holds on unavailable titles. To remove your rating for a title, click or tap your current rating. For example, if you gave a title four stars, click or tap the fourth star again to remove the rating. Once you remove your rating, the title will be removed from your Rated titles page. 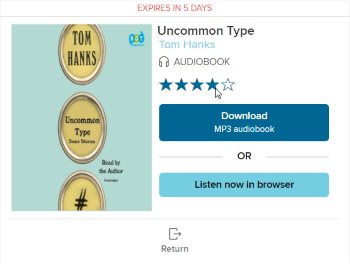 Once you're signed into your library's digital collection, you can assign star ratings to titles. To add a rating, tap or click on the star rating you want to assign. You can do this from a title details page (for any title) or from your Checkouts page (under your Account, for titles you currently have checked out). You can find all the titles you rated under your Account > Lists > Rated titles.